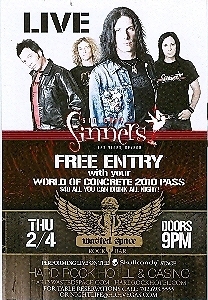 This promo card is for the Sin City Sinners' performance at the Hard Rock Hotel Casino, Las Vegas, Nevada, on February 4th, 2010. Sin City Sinners is a group of prominent musicians who perform self-penned originals and rock and roll. Card size: 4 X 6 in., in mint condition. Buyer is responsible for 1.00 postage within the USA and Canada. Send email if you need additional details on this card. Thank you for visiting my store!